​Seriously. Could this hat BE any cooler? Like the Friend that inspired it, Chandler is smart, casual…and a little scared of commitment! Turn up the brim, and it’s a toque. Turn down the brim and it’s a slouchy hat. 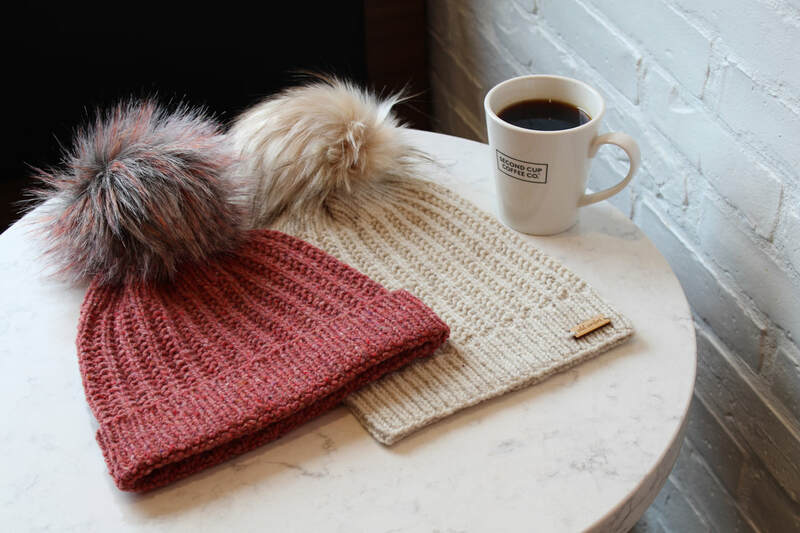 Don’t knit a brim, and it’s a beanie. Use one colour, or two, or three. Add a pom. Don’t add a pom. No matter what kind of hat you want to knit, Chandler’s got you covered! Beanie: 9” (23 cm) length x 8.5” (21.5 cm) width / 17” (43 cm) circumference [un-stretched, after blocking]; to fit 22-23” (56-58 cm) head circumference—average adult. Toque/Slouchy: 11” (28 cm) length x 8.5” (21.5 cm) width / 17” (43 cm) circumference [un-stretched, after blocking]; to fit 22-23” (56-58 cm) head circumference—average adult. Roll-up brim measures 2” (5 cm). Brooklyn Tweed Shelter (100% wool); 140 yards [128 meters] / 50 grams): 2 skeins in “Camper” (main image left) or 2 skeins in “Fossil” (main image right). Sample toque weighed 62 grams and used ~ 175 yards / 160 meters of yarn. One set of four double-pointed needles size US 7 (4.5 mm). ​23 stitches & 28 rounds = 4” (10 cm) in 1 x 1 Ribbing [un-stretched]. 23 stitches & 28 rounds = 4” (10 cm) in Textured Rib Pattern [un-stretched].